To meet diverse requirements of our clients in the best possible manner, we are offering a comprehensive range of Audio Video Data Cable for Portable DVD Player. The offered data cable is manufactured by adept professionals using premium quality raw material and cutting edge technology. Our provided video data cable is checked against different quality measures so as to ensure its quality. Widely applicable for transmission of video and audio signals, this data cable is available in different specifications. 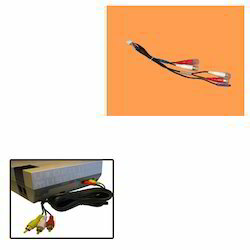 Looking for Audio Video Cable for Portable DVD Player ?